The COP21 United Nations Conference on Climate Change takes place in Paris from November 30 to December 11. Several organizations have formed the Paris Process on Mobility and Climate to highlight the role that transportation policy reforms can play in achieving emission reduction targets. Its theme is We Are Transport, which emphasizes that we all affect and are affected by transport, and so we can all contribute to more sustainable transport. There are, fortunately, many excellent “win-win” emission reduction strategies can help achieve multiple economic, social, and environmental planning objectives. They provide co-benefits, including road and parking congestion reductions, infrastructure cost savings, consumer savings, and affordability (savings skewed to lower-income users), improved mobility options for non-drivers, increased public safety and health, energy conservation, local and global emission reduction, and open space preservation. When all these impacts are considered, such strategies often turn out to be the most cost effective and beneficial way to reduce emissions. Consumer sovereignty, which means that, as much as possible, markets should respond to consumer demands. To the degree that some people want to rely resource-efficient travel modes (walking, cycling, public transit, and mobility substitutes, such as telecommunications and delivery services that reduce the need for vehicle travel) or want to live in more compact, multi-modal neighborhoods but cannot due to inadequate investments or unjustified regulations, serving these demands directly benefits those consumers and reduces pollution emissions and other external costs. Efficient pricing means that, as much as possible, prices (what users pay for goods and services) reflect the costs of producing those goods and services. This ensures that society does not spend two dollars to produce a good (such as road and parking space) that consumers only value at one dollar. Strategies that result in more cost-based pricing tend to increase economic efficiency and social equity. Comprehensive, strategic planning, which means that a planning process considers all significant impacts and options, so that individual, short-term decisions are consistent with strategic, long-term goals. 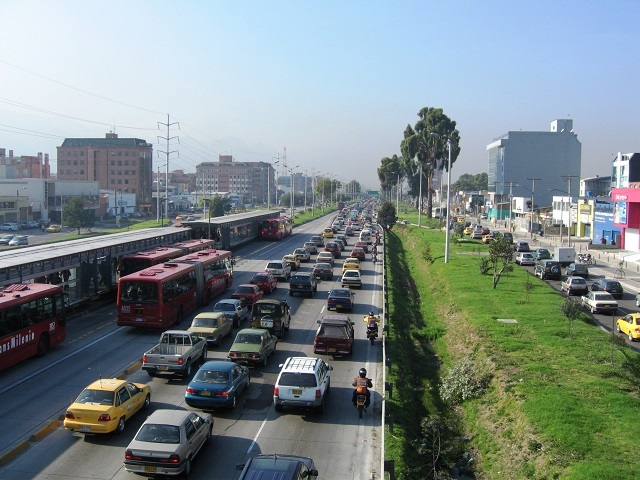 This means, for example, that potential emission-reduction strategies are evaluated according to their impacts on traffic congestion, and potential congestion reduction strategies are evaluated based on their pollution impacts, in order to identify the strategies that provide the most total benefits, and to avoid solutions to one problem that exacerbate other problems facing society. This type of analysis generally indicates that greatest variety of benefits are provided by strategies that reduce total travel, for example, by creating more compact communities and applying more efficient pricing. The second greatest benefits result from strategies that shift travel from automobile to more resource-efficient modes, such as improvements to walking, cycling, public transit and mobility substitutes. The third greatest benefits tend to result from strategies that improve motor vehicle performance, such as more efficient and alternative fueled vehicles that use less energy and produce less pollution per mile or kilometer traveled. As a result, many experts recommend Reduce-Shift-Improve emission reduction priorities (video), as indicated in the following table. Comprehensive evaluation considers a variety of planning objectives. Strategies that reduce total travel tend to provide the greatest variety of benefits. Shifting from automobile to more resource-efficient modes (walking, cycling, public transit and mobility substitutes) tends to provide somewhat smaller benefits, since these modes also impose costs. Improving motor vehicles tend to conserve energy and reduce emissions, but provide fewer co-benefits. Energy production and consumption receive large subsidies. These subsidies are economically inefficient and unfair, since they provide much smaller benefits to lower-income households, who use less energy, than higher-income households. According to a new International Monetary Fund study, “How Large Are Global Energy Subsidies?“, energy subsidies, including underpricing (when governments sell fuel at less than market value) and external costs (economic and environmental damages caused by fuel consumption), currently total about $5.3 trillion annually. Coal is the most subsidized fuel, which imposes $3.1 trillion annual external costs, followed by petroleum, with $1.5 trillion external costs. These subsidies are especially large (about 13–18 percent) relative to GDP in less developed countries. Eliminating these subsidies could raise government revenue by $2.9 trillion, reduce global carbon emissions by more than 20 percent, and cut premature deaths caused by air pollution by more than half. After accounting for increased consumer costs, this action would raise global economic welfare by $1.8 trillion. Another recent study, “Tackling Fossil Fuel Subsidies And Climate Change: Levelling The Energy Playing Field,” estimates that direct fuel subsidies total $550 billion annually, four times the level of subsidies going into renewables and four times the level of private investment into energy efficiency. 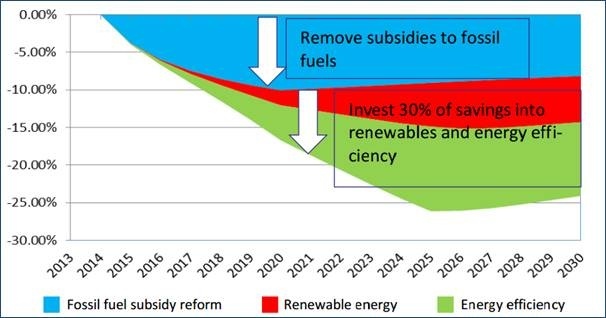 In 20 countries analyzed, eliminating these subsidies could reduce greenhouse gas emission by an average of 11 percent, and as much as 18 percent, if 30 percent of the revenue is reinvested into energy efficiency and renewables. Fossil fuel subsidy reforms are projected to reduce climate emissions by 10 percent by themselves, and up to 25 percent if a third of the savings are invested in renewable energy and energy efficiency. Carbon taxes are special taxes based on fossil fuel carbon content. Cap-and-trade policies allocate tradeable emission rights. Although the process differs, both increase fuel prices to reflect their carbon emissions, and therefore encourage consumers to produce less greenhouse gases. Fuel taxes help reduce pollution emissions and are also an efficient and fair way to finance roadways. Since these are unit taxes, such as cents per liter or gallon of fuel, they must be increased regularly to offset inflation and increasing vehicle fuel efficiency to maintain their value. Few jurisdictions do this, so fuel taxes in most countries are below what is required to recover roadway costs. For example, U.S. fuel taxes finance less than half of total roadway expenditures. In the United States, less than half of all roadway expenses are financed through vehicle user fees. This is economically inefficient and unfair. Fuel taxes will need to double for motorists to pay for roadways. Critics often argue that fuel taxes are regressive and economically harmful. In fact, their regressivity depends on how the revenues are used: they can be overall progressive (they benefit lower-income households overall) if they reduce other taxes, are returned as rebates to residents, or improve services used by poor people. Although petroleum price increases are economically harmful to oil consumers, fuel tax increases tend to be economically beneficial because they encourage energy conservation and so reduce the amount of money spend importing fuel. This helps explain why many countries with very low fuel prices, such as Venezuela and Saudi Arabia are less economically successful than countries with high fuel prices such as the United Kingdom and Norway: cheap fuel encourages waste and expensive fuel encourages efficiency. Walking, cycling, public transit, and mobility substitutes are resource-efficient: compared with automobile travel they generally have much lower user costs, require less travel and parking space and so reduce road and parking facility costs, consume less fuel, and require less embodied energy (energy used to build vehicles and facilities). For these reasons, society benefits if, as much as possible, transport systems serve the demand for these modes; if somebody prefers to walk, bike, use public transit or telework rather than drive, virtually everybody benefits if we make it possible to do so. This reflects the principles of consumer sovereignty and strategic planning. Even people who do not currently use these modes benefit from reduced traffic and parking congestion, accident risk, pollution emissions, and chauffeuring burdens. This does not mean that sidewalks, bike lanes, public transit, and delivery services should be provided everywhere, even if their costs are very high and demand is very low, but it does indicate that society should be willing to spend at least as much to serve a trip by these modes as it costs to serve an automobile trip, a concept is called least-cost planning. Experience shows that improving these modes often results in substantial increases in their use, indicating latent demand. For example, the U.S. Nonmotorized Transportation Pilot Program, which invested about $100 per capita in pedestrian and cycling improvements in four typical communities (Columbia, Missouri; Marin County, California; Minneapolis area, Minnesota; and Sheboygan County, Wisconsin), resulted in a 23 percent increase in walking trips and a 48 percent increase in cycling trips, mostly for utilitarian purposes. Similarly, public transit service improvements and transit oriented development often lead to substantial increases in transit ridership and proportionately larger reductions in automobile travel, a leverage effect. Many current planning practices tend to favor automobile travel over these resource-efficient modes. These include dedicated funding for roads and parking facilities that cannot be used to improve alternative modes or support demand management strategies, even if they are overall more cost effective and beneficial; transport system performance indicators, such as roadway level-of-service and average traffic speeds, which reflect automobile travel conditions and overlook impacts on other modes; and minimum parking requirements in zoning codes which subsidize automobile ownership and use. Multi-modal transport planning considers walking, cycling, public transit, and mobility substitutes, in addition to automobile travel, when evaluating travel conditions, defining transport problems, and identifying potential transport improvements. Least-cost transport planning and funding identify and fund the most cost-effective transportation improvements available, considering all impacts (benefits and costs), including alternative modes and demand management strategies. Complete streets policies ensure that roadway accommodate diverse users and uses. Transportation Demand Management includes various strategies that increase transport system efficiency, such as Commute Trip Reduction programs and Tourist Transport Management. Managed lanes and efficient road space allocation favors higher value trips and more space-efficient modes over lower-value trips and more space-intensive modes on congested roadway. As previously mentioned, a basic economic principle is that, as much as possible, the prices that consumers pay to use a good should reflect marginal costs of producing that good. Currently, motor vehicle travel is inefficiently priced: most roads and parking facilities are unpriced, and when prices are applied they often fixed and so fail to reflect the true marginal costs of a particular time, location and vehicle. Fortunately, new technologies allow more convenient and variable, and therefore more efficient, transport pricing. Below are some examples of transportation pricing reforms justified on efficiency and equity grounds, which can help achieve greenhouse gas emission reductions. Roadway cost recovery means that users pay directly for the costs of building and operating roadways. In many countries, user fees collect less than needed to recover roadway construction and operating costs, so roads are subsidized by general taxes. Raising fuel taxes to at least cover roadway costs, and more to internalize additional costs, is justified to increase economic efficiency and equity. Efficient road tolls mean that motorists pay directly for driving on a particular roadway, often with higher prices under congested periods to reduce traffic volumes that what roadway can accommodate. Efficient parking fees means that motorists pay directly for using parking facilities, with higher rates at times and places where demand is high, and lower rates where demand is low. Efficient parking management also involves reducing or eliminating minimum parking requirements, unbundling parking (renting parking separately from building space) and cash out free parking, so commuters who use alternative modes receive financial benefits comparable to parking subsidies provided to automobile commuters). Distance-based vehicle pricing changes fixed vehicle costs, including insurance premiums and registration fees, into variable fees that increase with vehicle-travel, which gives motorists a new opportunity to save money when they reduce their annual mileage. More neutral tax policies reduce current financial incentives that favor automobile travel over other modes. If fully implemented, these strategies would significantly increase the marginal cost of driving, typically by 50-150 percent (for example, raising the marginal cost from 15-20¢ to 30-50¢ per vehicle-mile), offset by reductions in general taxes (used to pay for roadways), rents and mortgages (that subsidize parking facilities), and fixed vehicle costs (such as vehicle insurance premiums and registration fees). On average, people who drive current average annual mileage would pay the same as they do now, but those who drive less than average would save money. Price increases of such magnitude typically reduce vehicle travel by 10-50 percent (assuming -0.2 to -0.35 long-term price elasticities), and larger if implemented in conjunction with improvements to alternative modes. Transportation and land use are two sides of the same coin: multi-modal transport both supports and is supported by compact development. Conversely, automobile-oriented transport planning both causes and results from sprawled land use patterns. Many current development policies tend to discourage compact, infill, and encourage sprawl. As a result, Smart Growth development policies that crate more compact, multi-modal communities are an important way to reduce climate change emissions and achieve other planning objectives, including consumer savings, increased public safety and health, and improved mobility options for non-drivers. Smart Growth includes various policies that result in more compact, mixed development and more multi-modal transport systems. These policies tend to have synergistic impacts (they become more effective if implemented together).They create communities with the combination of features – neighborhood services, well connected paths and streets, and multi-modal transport systems – that allow households to reduce their vehicle ownership, which provides large savings and benefits. Where all economically justified smart growth policies are implemented, per capita vehicle travel and associated emissions typically decline by 40-60 percent compared with what occurs under sprawled conditions. Support for more compact and mixed development. Support for more compact housing types (adjacent and multi-family housing, secondary suites, etc.). Reduced and more flexible parking requirements, and more efficient parking management. Affordable-accessible housing development (more affordable housing located in multi-modal neighborhoods). More compact and mixed development. Better public transit services, and more transit-oriented development. Reduced motor vehicle ownership and use. Better taxi and ridesharing services. Several policies can encourage households and businesses to purchase and use more efficient and alternative fueled vehicles, including many previously-described pricing reforms (increased fuel taxes, carbon taxes and carbon trading), plus rebates, and regulations that allow such vehicles to drive in city centers and managed lanes. Some jurisdictions, particularly in Singapore and many Chinese cities, prohibit gasoline motorcycles, which resulted in the development of efficient and low polluting electric motor scooters. Several other strategies support more efficient and less polluting transportation. Mobility substitutes include telecommunications (telecommuting, Internet shopping, etc.) and delivery services that reduce the need for vehicle travel. Improved traveler information and payment systems. Various policies can encourage the deployment and success of these strategies, including improved communications technologies, public-private partnerships, regulations, and pilot projects. These strategies interact in various ways; many become more effective if implemented together so travelers have a combination of improved user information, more efficient options (better walking, cycling, public transit, and mobility substitutes), and incentives to choose the most efficient option for each trip. Because alternative modes experience economies of scale (their unit costs decline with increased use), integrated programs help maximize the returns on public investments. For example, money spent on sidewalks, bike lanes, and public transport services are more cost-effective and beneficial if implemented with development reforms that increase the portion of housing and jobs located within convenient walking distance of transit stations, plus pricing reforms that encourage travelers to use these resource-efficient modes when possible. Current transportation systems are inefficient, both in terms of physical resources such as land and energy consumption, and in terms of economic efficiency, that is, whether residents are able to choose the combination of housing and transport options that best suites their needs. This is good news overall since it indicates that an integrated program of economically-justified policies can provide large emission reductions in ways that increase economic efficiency and equity, and help achieve other planning objectives. These reforms do not eliminate automobiles or force everybody to live in high-rise apartments; under most scenarios automobiles travel continues to have a significant mode share, and most residents live in single-family housing, but by creating more multi-modal transport systems and compact communities, people can use each mode for what it does best: healthy active transport for many local trips, convenient public transport when traveling on major travel corridors, and automobiles only when they are truly most efficient overall, considering all impacts. Compared with current transport and development policies these strategies can reduce per capita vehicle travel by 30-60 percent and provide even larger energy savings and emission reductions if implemented with more efficient and alternative fueled vehicles. Of course, many people resist change; they cannot imagine that they could benefit from higher fuel prices, less driving and more compact communities. Most people assume that they benefit from free roads and parking facilities, although these facilities are never really free, the choice is between paying indirectly, through general taxes and rents, or paying directly through user fees. Paying directly is usually more efficient and fair since it gives consumers a new opportunity to save money that is unavailable if costs are external. For example, if parking is bundled with housing, residents must pay, regardless of how many vehicles they own; with unbundled parking (for example, rather than paying $1,000 per month for an apartment with two parking spaces, they pay $800 per month for the apartment and $100 for each parking space), residents save more when they reduce their vehicle ownership. Similarly, paying directly for roads, and distance-based vehicle insurance and registration fees, give consumers more opportunities to save money, and are particularly useful to lower-income residents who tend to own fewer than average vehicles and drive fewer than average annual miles. Our challenge is to communicate a positive vision of more diverse and efficient transport. Who will create more efficient transport systems and more compact communities? We will! It is up to planners to assemble the ingredients needed to prepare our communities for the future. Our challenge is to create a positive vision for a successful, healthy, and resource-efficient future. Todd Litman is the executive director of the Victoria Transport Policy Institute. This blog originally appeared on Planetizen.